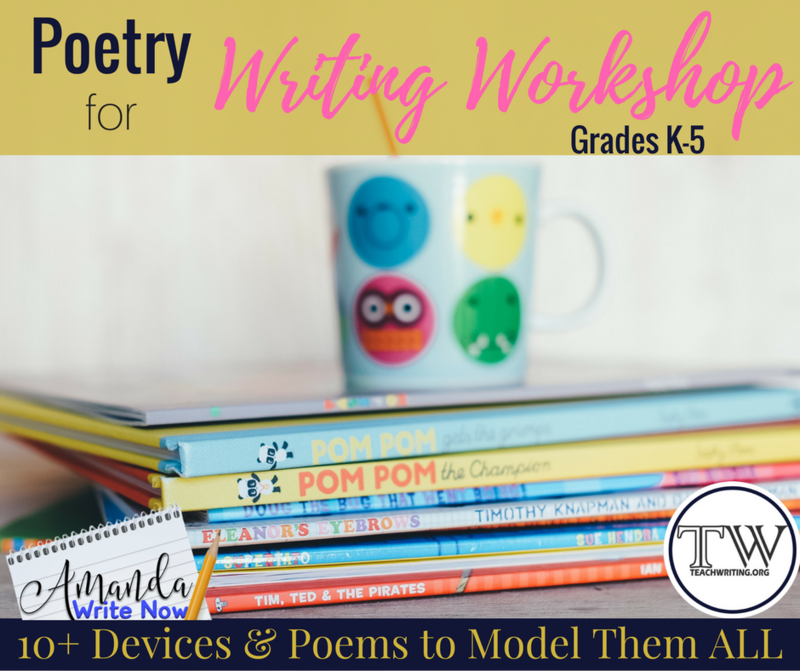 Poetry for Writing Workshop in Grades K-5: 10+Devices and Poems to Model Them All! Many teachers and students are intimidated by poetry, including me! There is just so much you can do, it is a bit overwhelming. Some teachers might also feel that teaching poetry is just fluff. I completely disagree! Meredith Dobbs, the founder and creator of teachwriting.org recently wrote a very helpful article, 10+Devices and Poems to Model Them All. In her article she organizes links to specific poems by writing device such as allusion, imagery and metaphor. It is a brilliant article and so useful to middle and high school teachers! After reading Meredith's article I realized, yes teaching poetry can be overwhelming, but it can also be beneficial to English teachers who want to teach these writing devices but aren't sure how or want to do so with a quick read, such as a poem. So, in this article, I've decided to do the same for kindergarten-fifth grade teachers. Below you'll find links to poems by device. My hope is that elementary teachers will benefit from having poems categorized in this way and plan to come back and add more as I find them. Feel free to add some poetry titles you enjoy teaching and which devices they reveal in the comments! Amanda Werner is a full time English and History sixth grade teacher in the Bay Area. She has been teaching for ten years and still feels like a novice. Every year is a unique and exciting challenge to inspire a new group of students in becoming avid readers and writers. Amanda reads educational literature voraciously and writes about the teaching of writing on her website amandawritenow.com. She also writes curriculum for Teach Box, a monthly subscription service for creative English teachers. Amanda received her B.A. in English Literature with an emphasis in Humanities at Western Washington University. She has both an elementary and secondary teaching license and a mathematics credential. In her free time, Amanda loves being outdoors with her humorous husband and sweet and spunky two and a half year old daughter.